What is so Unique About Youth and Young Adult Ministry in the PSWR? Recently I was in conversation with one of our General Church leaders who caught me a bit off guard by saying, “The PSWR Youth and Young Adult Ministry is being watched by the larger church. You all are really doing amazing things.” How exciting and scary all at once. This conversation got me thinking about what it is that people might not see about the PSWR Youth and Young Adult Ministry by observing as a spectator. For the first time in its 30 years of existence, in 2016-2017 the Youth Leadership Team (YLT) received and accepted applications from youth belonging to each of our organized constituent ministries (NAPAD, Hispanic Convencion, and African American Convocation). With 21 youth on the regional team and six adult mentors, our camp ministry season this year was one of the most diverse and culturally inclusive we’ve had the privilege of hosting. 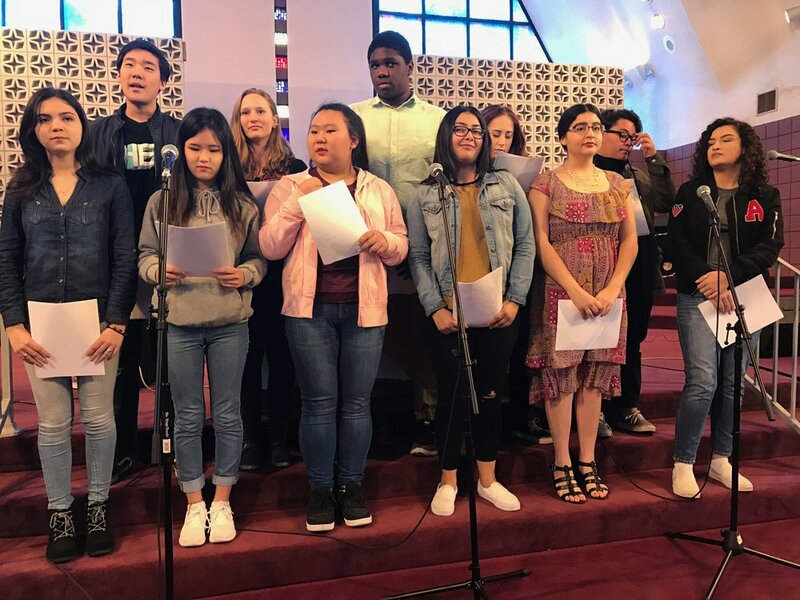 Each youth brought a different perspective to worship, prayer, and conversation. Our Regional Church is stronger because of this work! In 2016 we launched the Youth Immersion Ministry (YIM), an anti-racism/pro-reconciliation leadership training program for high school youth that give immersion opportunities in cultures other than their own while providing a safe and trusting community of peers and adults in which to process how to approach issues of division in the world. Four youth from each constituency (NAPAD, Convencion, Convocation, and Anglo-European Communities) are selected each year to participate with very little financial requirement from them. We had 10 youth from the PSWR travel to South Korea this summer. To say we experienced culture shock would be an understatement, but it opened the door to honestly reflect on our cultural biases, prejudices, and assumptions. We did hard work that resulted in more compassionate, more aware, and more equipped young leaders to serve Christ in the world today. This has been made evident in the YIM and YLT end of the year project presentations which reflected the significant growth our regional youth have experienced in recent years. 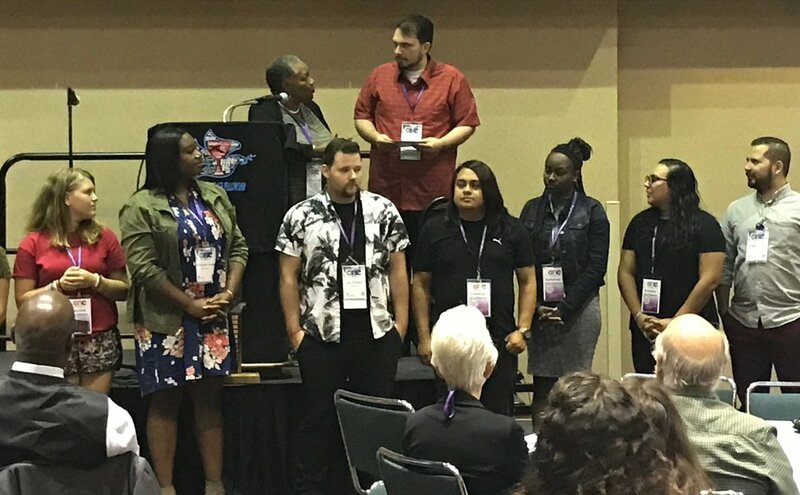 At General Assembly in July, the PSWR Youth Ministry was honored to receive the Bratkovich Award from the Disciples Peace Fellowship for our work, especially with the Youth Immersion Ministry and the Winter Youth Summit – UNITE in February of 2017. It was a surprising and exciting moment for our young people who attending General Assembly. Whether it is presenting at the Martin Luther King, Jr. Celebration early this year, providing hospitality and staffing business sessions at General Assembly, serving on a discussion panel at Regional Gathering, or forming an inclusive planning team for UNITE 2018, our young people are engaging their gifts in leadership and intentional development of our regional programming. If you were at Regional Gathering this month, you may have seen “God’s Gallery”: an artistic expression of the spiritual work our young people have been participating in this year (drawings, pottery, photos, and more). God’s Gallery was organized, curated, and staffed exclusively by the hands of youth and young adults in the PSWR. This was their idea and desire to demonstrate their voice in the larger church. It was beautiful and awesome to see. Our youth and young people have had the unique opportunity to meet with our new General Minister and President, Rev. Teresa Hord Owens, twice this year. Once at UNITE where Terri preached the opening service and once at General Assembly where Terri met to discuss youth ministry exclusively with our youth and young adults. This has given the PSWR youth access to the General Church in ways we’ve not experienced in recent years. They shared their hopes with our GMP and our GMP listened to their concerns directly. Several of our young people are in ongoing conversations with Terri through social media and are working with her on a special project for UNITE 2018. XPLOR Residents, Disciples Peace Fellowship Interns, Chapman University Students, HELM Fellows, Disciples Seminary Foundation Scholars, the Forum for Theological Exploration participants, a grant from the Oreon E. Scott Foundation, and much more engage our young people in leadership development and service in ways that tap into their passions for God’s people. We are the PSWR, and our region offers accessible resources, as well as, a strong connection with the General Church. Many of our young people have and continue to be supported by these resources. This month I had the privilege of speaking with Dr. Dee James Atwood, Director of Admissions and Assistant to the Dean of Students at Texas Christian University (TCU). Jim was enthusiastic about connecting our youth to Disciples scholarships available. He said, “I am committed to put Disciples dollars in the hands of young people from your region.” All participants in our Youth Leadership Team and Youth Immersion Ministry (as well as any young adults interested) are eligible to receive up to 50% tuition for their service to the Christian Church (Disciples of Christ). · Campbell-Stone Heritage Scholarship is $16,000, renewable every year, for a total of $64,000. · The Alexander Campbell Religious Leadership Award is $5,000, renewable every year, for a total of $20,000. This scholarship requires an essay, and two letters of recommendation documenting their leadership in the church. Recipients of the Alexander Campbell Religious Leadership Award become members of the Alexander Campbell Scholar program where they will be discipled and mentored. · $1,500 scholarship, renewable every year, for a total of $6,000 for students who are sons or daughters of DOC clergy. · Outside of church scholarships, we offer merit scholarships between $4,000 - $18,000, the Presidential Scholarship - full-tuition, Honors College Scholarship $23,000, and Kalon Scholarship $19,500 for student leaders. The first three scholarships listed are stackable for a total of $22,500. In addition, an alumni referral scholarship of $1,000 (renewable for $4,000) and a campus visit grant of $250 (renewable for ($1,000) can be added, totaling $23,750. The current tuition at Bethany is $27,250. Puerto Rico, Hawaii, Mexico, South Korea, Israel-Palestine…the list continues to grow. Our regional youth and young adults are given the amazing opportunity to travel across the globe to experience expressions of the Church that challenge our understanding of God to help us grow in faith and serve God’s people. In 2018 we will be hosting the Immigration Immersion Project. Young people from all over the General Church will travel to the PSWR for a 10 day training in Southern California and Tijuana, Mexico. I am grateful for the support of Rev. Lori Tapia, Rev. Xose Escamilla, Rev. Sadie Cullumber, and many others who have pledged their support for this important opportunity. We will also be taking a team of youth on an East Coast Work Tour next summer to Washington, D.C. and Virginia where we will participate in mission projects and visit historical sites. Further down the pike, we hope to accept the offer to travel to Australia to learn about reparations for the Aborigines and their culture, and to Kenya for a unique experience to discover God on safari. The PSWR Youth Ministry focuses on developing Christian leaders to serve in the world today. We believe that what we practice shapes our character. So, we are focusing on five areas of spiritual formation to compliment the work being done in the local church: Hospitality, Local Service, Global Missions, Mentorship, and Disciples Identity. Our hope is that by the end of a youth’s high school career they will be equipped with experiences of strong community, a broad awareness of the world around them, and a sense of the calling God is placing on their life to serve those in need. We believe that this is best achieved when Pastors, lay-leaders, and other local units are confident in the effectiveness of regional programming. We desire for churches to be eager to connect youth to regional resources so that they are stronger leaders in their home congregations and in present in the general church. We actively resist the temptation to settle into a small group of youth from a few congregations. We practice an open table where ALL young people are welcome to participate and bring their questions about how faith is applicable to their lives. This means that sometimes we will disagree on theology and practice… but instead of seeing this as something that puts us at odds, we celebrate the diversity as an opportunity to pull together the gifts of God’s people to make a bigger impact. We can do more when we do it together! Our goal is to engage each person’s gift and passion in service in a way that is authentic and effective in addressing real needs. We are UNITED in our cause to serve God in the world today! Our volunteers and youth meet at least six times a year to pray together, sing together, strategize together, process together, and discern what it is that God is calling us to do next. These sessions allow for young people to take risks, to make their visions for ministry a reality, and to be confident that they are supported by a loving and accountable community. We see what God is doing in our midst and we are excited to be a part of regional ministry for such a time as this! We are currently accepting applications for YLT and YIM, and we are always praying for more young adults to step into leadership. Thank you for the ongoing support and for the overwhelming affirmations that keep us trucking along.